For some people, the lack of starchy foods on their plates seems a little boring. I can't say I mind having just a big piece of fish or meat, with a big salad, but sometimes it's nice to spice up the ordinary daily plate. This is such a recipe. Ordinary meat transferred into spicy meat with a surprise inside. Mix the meat with the egg white and spices. Knead thoroughly. Devide the meat into two portions and flatten on a work surface, like in the picture below. 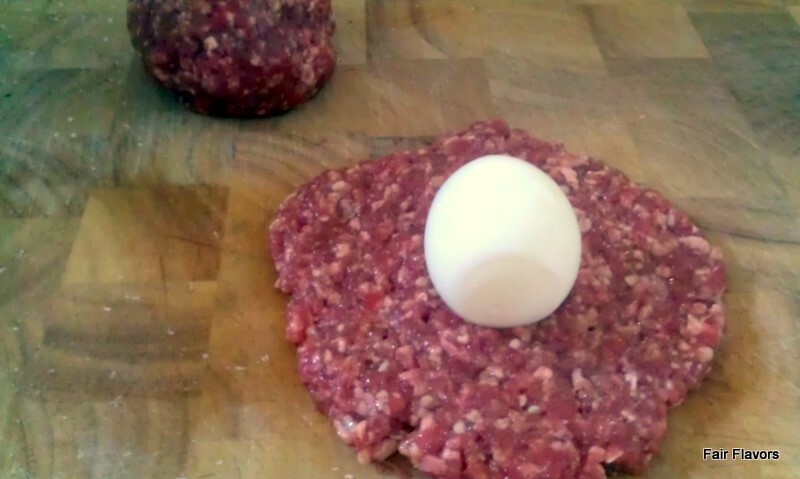 Fold the meat around the egg and seal. Make sure it's properly sealed. Heat, on high, a good amount of fat (2 tbsp) in a deep pan, for instance a Dutch oven. When the fat is hot, take the meatballs between to spoons and gently lower them into the pan. Now comes the hard part. You've got to cook them all around. That's not easy, because of the round shape, but with the use of two spoons, it's a little easier. Just be patient and turn them every two minutes, moving them around a little, so they don't stick to the pan (and avoid breaking the meat). Once you've seared them all around (which makes them slightly crispy on the outside), lower heat to very low, put the lid on, and let them cook for about 20 minutes, turning them every now and then. Great idea. I can't wait to try this. My husband is going to LOVE these!! I pack his lunch everyday. Tomorrow, he'll have a great surprise!! I bet you could put these on a sheet pan and bake in the oven like meatballs, they would get brown all over without having to turn them and possibly breaking them. In Guyana, they make something similar. 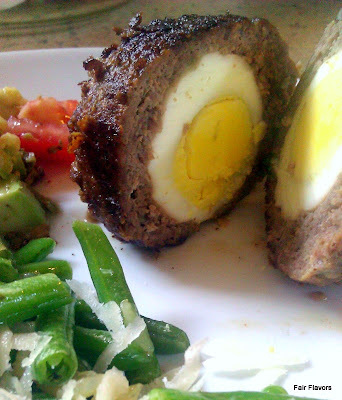 It is with mash potatoes or mash cassava around the boiled eggs. Fried the same way and cut in the middle when finished. Add some thai sauce, hot sauce or your choice. Love it. Great idea though! Yes it is. If a recipe has no flour whatsoever, you can count on it being gluten free, since gluten is only present in some grains.